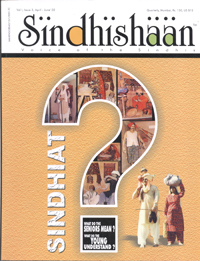 Thank you very much for sending me your magazine, Sindhishaan, Vol 1. Issue 2, Dec.’01. – Feb.’02. I have gone through its contents with great interest. I am sure this magazine will be very useful for all Sindhis in India and abroad. All the best for the prosperity of your Institution. Copyright © 2012 - Sindhishaan.com (India) Pvt. Ltd.
Reproduction in any form is prohibited without the express permission of the Editor.